Organizations widely use desktops to perform their day-to-day operations. These desktops in any organization have the following limitations. Xoriant is observing optimum usage of desktop resources by implementing OpenStack Private Cloud. OpenStack usage in Private Cloud provides multi-tenancy across different projects and scalability in terms of compute, network, and storage. Xoriant Private Cloud implementation using OpenStack ensures the cloud initiative across the organization is used by end-user. Xoriant has implemented Private Cloud by using OpenStack (Havana & Icehouse). The Cloud Infrastructure is deployed over Ubuntu 12.04 along with KVM hypervisor being used for virtualization. Xoriant Private Cloud differs from pure virtualization. 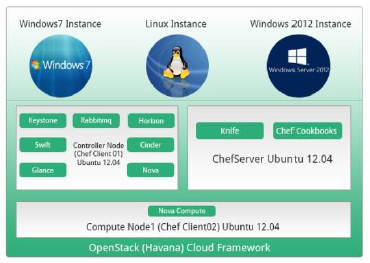 The OpenStack (Havana) Cloud Framework uses KVM hypervisor and performs the orchestration of the resources. Therefore, virtualization of resources (compute, storage, and network) is performed by using KVM hypervisor and the underlying infrastructure resources are provided as a service by using OpenStack Cloud Framework. In Cloud monitoring OpenStack Ceilometer aims to deliver a single central contact point, via a REST API, Ceilometer’s metric collecting mechanisms are tightly coupled to OpenStack which limits both its portability and interoperability. JCatascopia Monitoring System is platform independent, thus it is deployable and functional on any underlying IaaS cloud platform since its metric collecting mechanisms are not cloud platform specific so Xoariant has deployed JCatascopia in OpenStack Private Cloud.